Setting up Home IPv6 Network using Tunnelbroker and Tomato Shibby Mod | Random Thoughts! 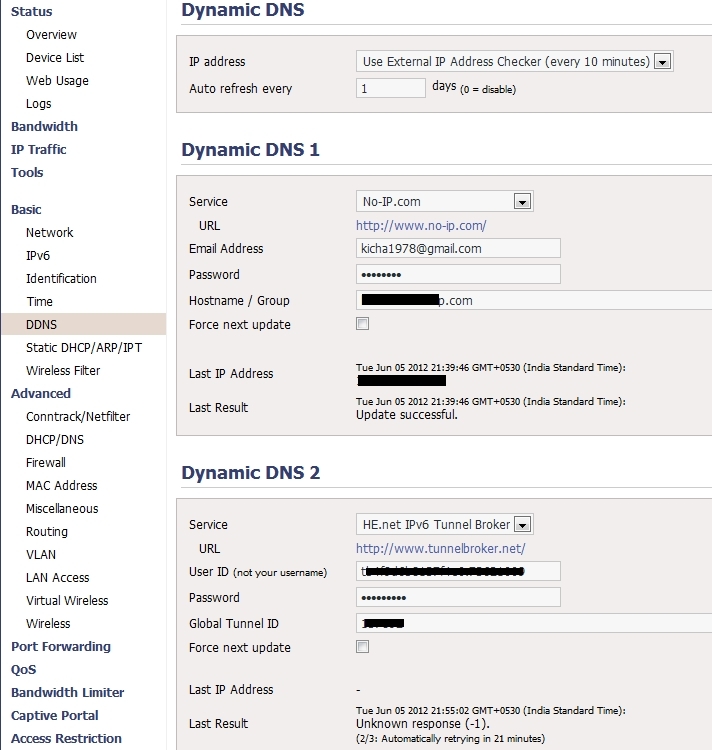 1) Signup for IPv6 Tunnel broker and create a tunnel. In this example HE Tunnel broker is used. 2) Configure the Client with the steps provided. If you are using Windows 7 machine the Tunnel can be created directly from that machine. 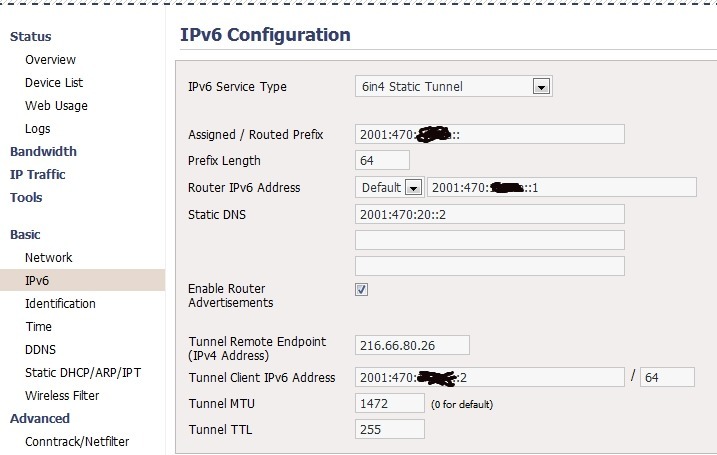 But I want have my router to act as Tunnel client and auto configure the local client with IPv6 address( from the routed prefix that was assigned). I have already configured router Asus RT-N16 with IPv6 capable Shibby mod. Now the official RT-N16 firmware also supports IPv6! 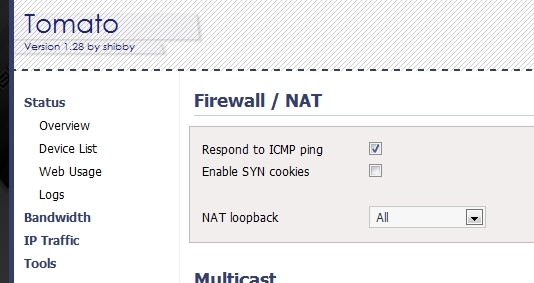 2b) In case static IP(v4) is allocated by the ISP DDNS config must be set and update the HE.net Tunnelbroker. After these settings reboot the router. 3a) Win7: Check the IP addresses useing “ipconfig” command. 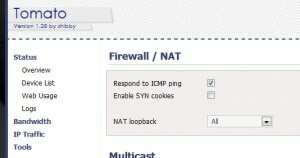 IPv6 addresses should be allocated in the router prefix range. 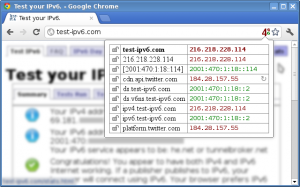 4) Check if the sites you visit has IPv6 enabled. 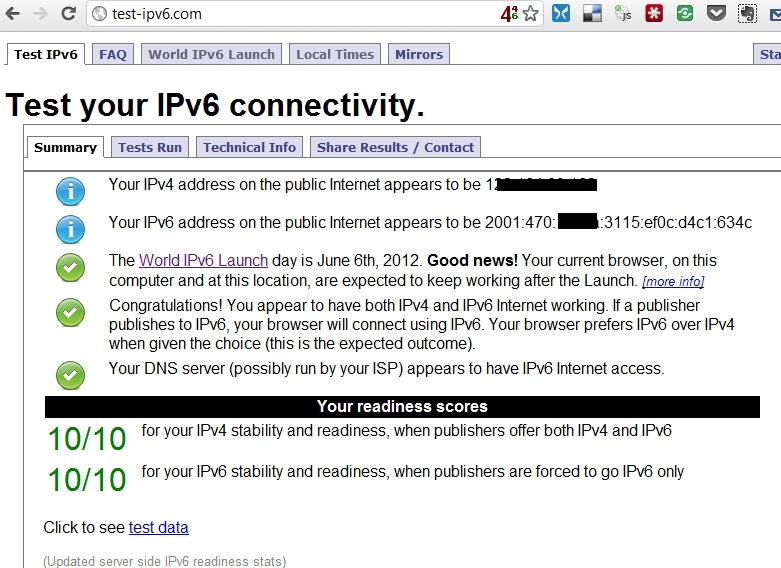 Well, now I am ready for the World IPv6 Launch tomorrow! yes. The encapsulation should degrade the performance a bit. 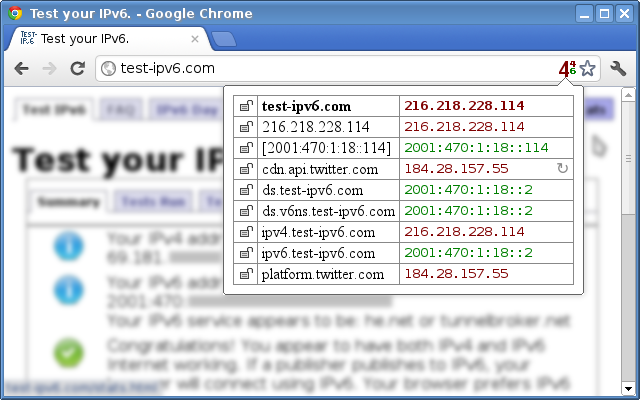 But, I don’t see any visible performance improvements & degradation when visiting IPv6 enables sites. Thanks for this. I have a 6 Mbps up and down cable connection with Spectranet. 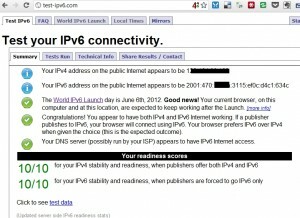 IPV4 works fine. However, if I use he.net tunnel broker, I get terrible speeds of not more than 500kbps down. Can you tell me which tunnel u use for good speed? I have tried Singapore, Amsterdam and London so far. Or is there some other setting I need to do on my Asus Router to get good speeds? Please help.